I should need the option when invoice is made ex: Invoice-2018011, and the client returns his products, i need to make a refund and also a CreditNote from that invoice. 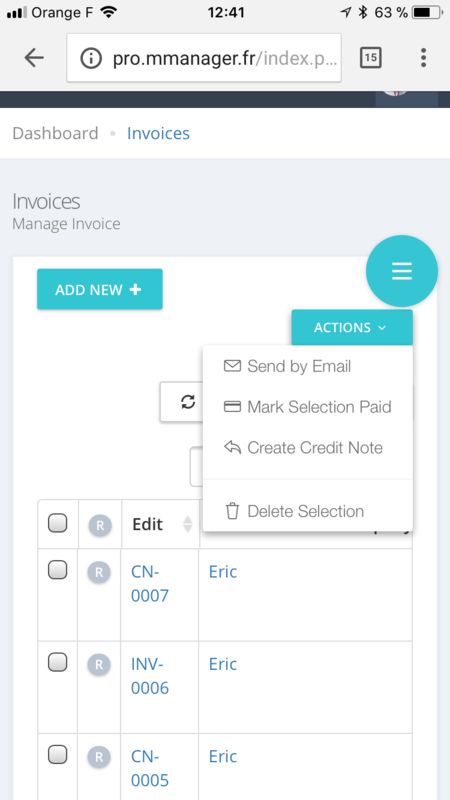 Should become handy when the module have the option: CreditNote mangager / make CreditNote / dropdown select whit invoices / select the invoices that should been credited and automatic makes the calculation and settings. Hit button Save and Send and done. But maybe not handy for 1 product when the client have more products. So manual adding is also fine. I bought this module, but dident know there was no creditnote manager. Like to see this future verry fast, offcourse i pay this. what do you mean by next number ? Let's say invoice 1 is refunded, but before the refund autoincrement is to 23; when you refund, you want it to be 24. Right ? if customer has 10 items on the invoice and needs refund for one, how do you handle this in real life ? I say all this because a good way of implementing without hacking the whole system would be to add a link under Action group . This will duplicate the invoice will all items. Then you delete rows that are refunded and save it as a regular invoice. Let me know if this could a solution. i have now excel and make a credit nota from that product. (problem is this i made from scratch and is all manual, so when i need to search somthing if have to dive in papers, or stock is all manual in excel. ), for this reason i bought your module. When i duplicate the invoice and delete rows i can not change the prefix INV to CN, that i needed for taxes. When i have a control from taxes and dead, and dont have that CN invoice my bankstatement is also not correct because the refund. So we say the same thing. Here is direction I think best. Not done yet, many vars to update but you can test and tell me. Create a invoice, mark it paid. Then use the action button to set it as Credit note. You can then open it to check value and save it. If you have a credit note file, it would be cool. I will then update the edit form and PDF titles and vars. As I spend all my night on it, you will need to send me loooot of coffees if it fits your needs. Demo is here pro.mmanager.fr with default credentials. Offcourse, you dont have to that for free. But refunding with Creditnote number is needed here. Its not needed at one day or 2. When i make an invoice and create credit note, nothing happens. Yes seems when i add invoice and create credit note nothing happens. You just need to select the paid invoice and use the action link to mark it. Are you available for teamviewer in 15-20 mn ? My accountant is happy now. Just the prefix have to be the same as the invoice because it shows already Invoice: number or Creditnote: number. In this case the CN-2018002 have to be CN-2018001 when you use different prefix, the numbers have folow up in the same prefix. I use for both the same prefix now and that fine by me and the numbers folow nicely up withe same prefix.